When Larissa Boiwka ’05 was an anthropology undergraduate at Ohio State studying ancient cultures, she never imagined where her degree would take her after graduation. After taking classes on witchcraft, archaeology and tribal cultures, Boiwka traveled extensively, tracking the sites she learned about in her classes. She even had the opportunity to summit a volcano in Guatemala to visit the shrine of the local deity Maximón, an impish saint who accepts offerings of hand-rolled cigarettes and alcohol. “The expedition sounded like the beginning of an Indiana Jones movie, so of course, I jumped at that invitation,” said Boiwka. Boiwka’s adventurous nature lends itself well to life as an entrepreneur. 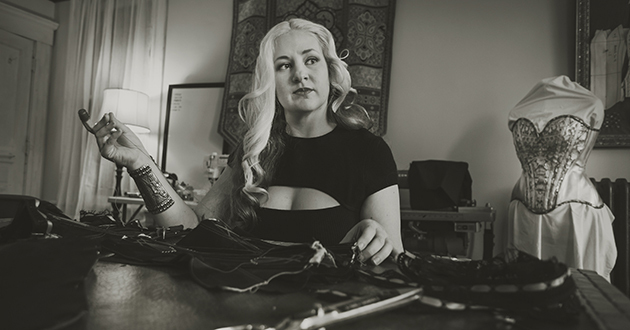 Her bespoke corsetry business, Wilde Hunt Corsetry, formed serendipitously after she made a corset for herself for a Halloween costume. 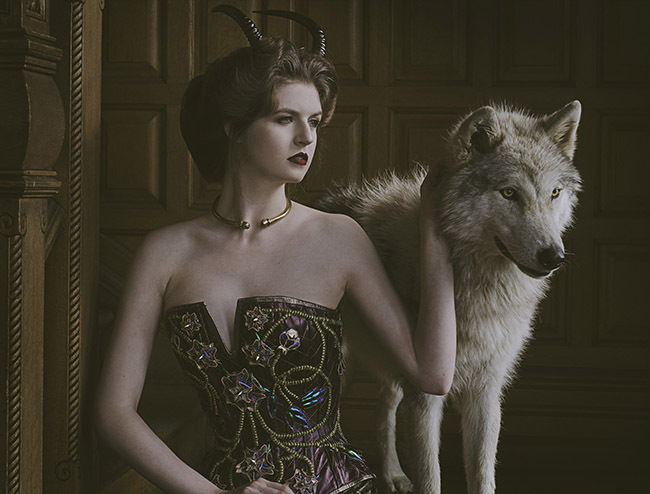 Model Amelia Bindofer wears one of Boiwka's custom corsets. Photo by Rachel Lauren. Under the Wilde Hunt Corsetry label (wildehunt.com), Boiwka creates custom leather corsets, often using historical beading and embroidery techniques and incorporating inspiration from the ancient cultures she studied in school. Boiwka, who is an entirely self-taught designer, credits the education she received from Ohio State's Department of Anthropology with setting her up for success as an artist and small-business owner. “The things I read about, the cultural sites I visited and the relationships I formed as a result of my education at Ohio State still inform my work as an artist today,” she said. Boiwka also cites the cognitive and language skills she gained during her studies with helping her tell her story today, as well as securing grants and funding for her projects. Her studies also provided the inspiration for her shop’s unique name. Taken from a lecture in Professor Sarah Iles Johnston’s class on witchcraft in the Center for Medieval and Renaissance Studies, “The Wilde Hunt” (or “die Wilde Jagd”) is a myth that tells of an ethereal hunting party, and includes divinities such as Frau Holle, Hulda, Diana, Freya and Odin. The topic captured Boiwka’s interest immediately. “I thought this story painted a really lush creative landscape that could hold a wealth of tales, almost a unique universe in and of itself for me to create within,” Boiwka said. In addition to creating custom corsets for clients worldwide, Boiwka has captured the attention of television and music producers. She has created pieces for music videos and, most recently, the PBS Civil War drama Mercy Street, which premiered in 2016, starring Josh Radnor. Mercy Street costume designer Amy Harrell Andrews commissioned Boiwka to create two period corsets for the show and tasked her with the unique challenge of blending the show’s artistic aesthetic with historically accurate details. Luckily, Boiwka had access to Ohio State’s Historic Costume and Textiles Collection, which provided her with inspiration and guidance to help her craft the historic costumes. Although her work on Mercy Street is complete, Boiwka’s partnership with PBS allowed her to contribute to a new series on the network. The new show Civilizations examines the role of art and creative imagination throughout history, and PBS publishes blog posts written by current artists to accompany each new episode. Boiwka was asked to provide her reactions to episode two, entitled “How Do We Look?” which centers on art and the human body. According to Boiwka, this assignment gave her the opportunity to reflect on her work and her education. “Examining the human body through art and viewing my work through an anthropological lens brought the journey of my education and my business creation full circle for me," she said. Reflecting on her experience at Ohio State, Boiwka recommends aspiring artists cultivate good observation skills and always be on the lookout for new opportunities. She also reminds young people to be kinder to themselves.